The half-inch flowers of bluecurls bloom in the morning after rain the previous day. The blue color and long, curling stamens – the pollen-bearing parts – give the plant its name. The spotted lower petal provides a landing pad for insect pollinators, which then get dusted with pollen from the curving stamens. The small, low plants are covered with tiny hairs with glands that make sticky, scented oil. The goldenrods of August bring thoughts of back-to-school, but there’s still time to enjoy new things in natural world this month, such as baby snakes, bluecurls, and wild mint. As you walk the trails in town, chances are good that you’ll see tiny new toads and dime-sized young frogs leaping across the path ahead of you. If you’re lucky, you might also spot a small baby snake about the size of an earthworm sliding across the trail – most likely a garter snake (Thamnophis sirtalis), which is harmless like any other snake you might find in Westborough. And while you’re looking down, watching where you step and scanning the trail ahead, you might notice eastern bluecurls (Trichostema dichotomum), a lovely small native plant in the mint family. Bluecurls start to flower in August, especially in the morning after a rain, when they bloom profusely. They can continue to bloom into October if conditions are right. Look for bluecurls by the side of trails that pass through dry fields or open, sandy areas. The dry fields at the Bowman Conservation Area can be a good place to look. (You can also find bluecurls on the Cape, if you vacation there.) These plants are low, usually about 6-15 inches tall. 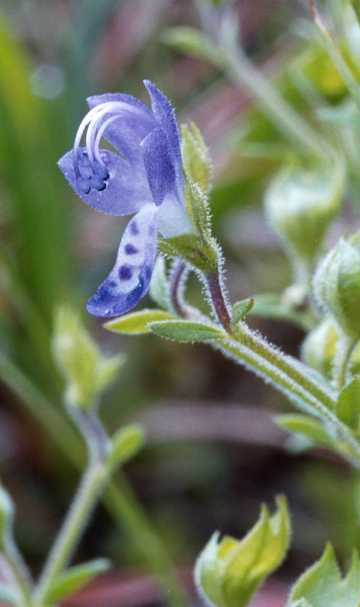 The distinctive half-inch blue blossoms seem large on the dainty plants. One look will tell you why the plant is named bluecurls. The notable long "blue curls" are actually the flower's curving stamens – its male pollen-bearing parts. They are poised to dust pollen on the back of a bee, fly, or other insect that alights on the landing pad formed by the flower’s blue-spotted lower petal. What about this plant says “mint”? If you look closely or have fingers nimble enough to feel the wiry stem, you’ll probably notice that the stem is square, which is typical of the mint family (Lamiaceae or Labiatae). At the same time, you might find that the plant is slightly sticky from its oils. These oils come from glands on tiny hairs covering the plant. (Yes, plants have glands.) If you tear up one of its small leaves, you might get a whiff of an aroma. Both the stickiness and the aroma are typical of mints. Some people say that bluecurls smell like balsam. What good is the aroma? Many chemicals that plants make help either to attract animals, including insect pollinators, or to keep away animals and insects that might eat the plant. In the mint family, the scented oils may do both. They attract bees and other insect pollinators and discourage damaging insects, such as caterpillars. A close-up view of tiny wild mint flowers, which are crowded in clusters where the leaves meet the stem. The stamens stick out of the flowers and give them a fuzzy appearance from farther away. In August, native wild mint grows on the wet shores of Westborough’s ponds, such as the Westborough Reservoir and Mill Pond. The chemicals in plants often lead to traditional uses in food or folk medicine, but it’s not clear that our eastern bluecurls had such uses, except perhaps as a tea. Native Americans in the western U.S. reportedly used at least one closely related plant (such as western bluecurls, Trichostema lanceolatum) to stun fish. They’d mash up the plants and dump them into pools of water or slow-moving streams and then use baskets to scoop up the fish that floated to the surface. This practice doesn’t make it tempting to try a tea made from our own bluecurls! Our native wild mint (Mentha arvensis), on the other hand, has a long history of use in food and medicine. It, too, blooms at this time of year. Wild mint plants grow 1-2 feet tall on the damp shores of local streams and ponds such as the Westborough Reservoir and Mill Pond. Wild mint plants have the characteristic square stem of mints and a mint scent that’s easy to recognize. Crowded clusters of tiny fuzzy-looking flowers grow where leaves and stem meet. The bell-shaped flowers can be lavender or white. Their stamens stick out of the flowers, but they don’t curl as in bluecurls. Some individual wild mint plants have a tastier mint flavor than others. If you’re actually gathering wild mint to use as flavoring, it can be a good idea to sample the plants beforehand. Native Americans flavored meats with native wild mint. They also made tea from wild mint leaves to soothe many ailments, from upset stomachs to colds, fevers, and sore throats. They passed these uses on to European colonists, who brought their own European mints for similar uses. Europeans, in turn, originally got these mints from Arab and Persian gardens. These imported mints are familiar to us today as spearmint (Mentha spicata) and peppermint (Mentha piperata), and you can sometimes find them growing wild because they’ve escaped from gardens. Unlike native wild mint, both of these non-native mints have flowers in spikes, instead of tucked into the crooks between leaves and stem. In the past, American farmers sometimes stored grain with mint because the mint scent helped to keep away rats and mice. Mint is also sometimes planted with cabbage and tomatoes to ward off white cabbage butterflies (Pieris rapae). Also originally from Europe, these butterflies lay their eggs on plants in the cabbage family (Brassicaceae) for their caterpillars to eat after hatching. 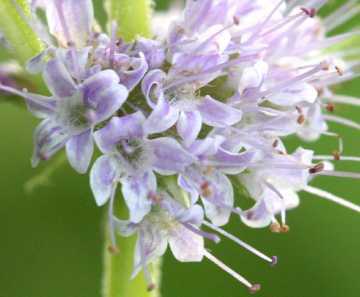 August’s bluecurls and wild mint are just two reasons to appreciate the huge mint family (Lamiaceae or Labiatae), with nearly 7,000 species worldwide. It includes many kitchen herbs, such as basil (Ocimum), oregano (Origanum), rosemary (Rosmarinus), sage (Salvia), savory (Saturega), and thyme (Thymus), as well as catnip (Nepeta) and bee-balm (Monarda). The family even includes teak trees (Tectona), valuable for timber and furniture, which are now considered members of the mint family. Other treats to enjoy in nature this month include nesting goldfinches (See “Goldfinches and summer's thistles”), bright red cardinal flowers on the shores of our lakes and streams (see “Cardinal flower attracts hummingbirds & butterflies”), and the summer orchid in our woods, downy rattlesnake-plantain (see “Tiny orchids of August”).